Tensions are only likely to get higher as the proposal moves forward. This week’s vote kicks off at least a three-month period of pubic comments, during which the commission can expect to be deluged with input, ranging from the substantive to he hysterical. Democrats on Capitol Hill, meanwhile, are vowing “all out war” to prevent any rollback. Democratic commissioner Mignon Clyburn used Thursday’s public meeting as a platform to denounce the proposal and to call on members of the public to challenge the rollback in court, a tactic many legal experts say would stand a reasonable chance of success, given that the commission’s abrupt reversal on rules implemented just two years ago could well meet the legal definition of the sort of “arbitrary” and “capricious” actions federal agencies are supposed to avoid. 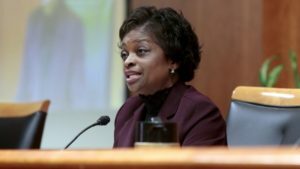 There’s also the possibility that Clyburn herself will leave the FCC at the end of June, when her current term expires, which would leave the already depleted commission one commissioner shy of the quorum needed to give any of its actions the force of law. Efforts to fill the by-then three vacant seats on the panel could well set off a major battle between the White House and Democrats on the Hill, which given the current chaos in Washington (Nostrovia!) could drag on indefinitely. All of which is to say, we’re a long way from any formal rollback of the rules taking effect. Between now and then, though, we’re likely to hear a lot of overheated rhetoric and exaggerated claims from all sides of the debate. As with the first time around, much of the public debate will focus on the alleged dangers of introducing “fast lanes” and “slow lanes” on consumer broadband connections or the blocking or throttling of disfavored content by ISPs. For the streaming industry, however, the most substantive of the proposed changes would be the elimination of the current regulations’ “general conduct” standard for reviewing possible violations of open internet principles not covered under the rules. That somewhat nebulous concept was introduced by previous FCC chairman Tom Wheeler to give the agency the authority to review interconnection agreements between edge providers and last-mile ISPs without issuing formal rules governing those arrangements, which were still evolving at the time. That effort was in someways the linchpin of the entire previous rulemaking, including Wheeler’s decision to reclassify broadband access as a Title II telecommunications service. Whereas rules prohibiting blocking and throttling likely could have been sustained under the FCC’s existing authority without reclassification, asserting authority over interconnection arrangements could only be sustained if internet access was brought fully under FCC jurisdiction, with its public interest standard. Legally, that could only happen if internet access were formally classified as a telecommunications service under Title II of the Communications Act. For all the sturm und drang over fast lanes and slow lanes, the number of confirmed cases of content-based throttling of consumer bandwidth is very small. Prioritization of favored content via zero-rating is increasingly common, and in some cases paid for, but it’s not clear that providing consumers with what amounts to free bandwidth qualifies as the sort of consumer harm that the FCC could or would prohibit, even under Title II. Interconnection arrangements, however, were the source of fierce and genuine disputes between streaming services like Netflix and ISPs like Comcast, Verizon, and AT&T. You could argue, as many do, that the government should stay out of such disputes and let market forces sort out the arrangements. But you can’t argue that interconnection arrangements aren’t directly material to the business of streaming. For better or worse, rolling back Title II would likely end the FCC’s jurisdiction over those arrangements, which could well rekindle the peering wars.